Earthquake of 5.8 magnitude hit Virginia on 23rd August 2011. The tremor was felt in various parts of New York. Earthquake of 5.8 magnitude hit Virginia on 23rd August 2011. The tremor was felt in various parts of New York. Colorado people have also witnessed an earthquake of similar magnitude on 22nd August, 2011. According to a latest report published by the Insurance Information Institute, nearly 5000 earthquakes happen in our country. Earthquakes have ruined the life and properties of the residents of 50 states since 1990. So, there is no guarantee that your state will not be hit by an earthquake in future. Recent earthquakes in California, Colorado and Virginia are compelling people to give special consideration to earthquake insurance. The reason is, homeowners or other insurance policies do not provide any kind of coverage for the damages caused by earthquake. Read along to know about earthquake insurance in details. This insurance covers the fatal damages inflicted on your home due to an earthquake. 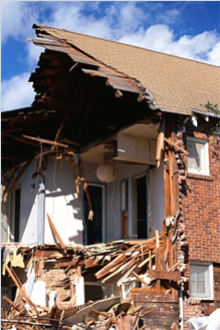 Your homeowner insurance policy will not give any protection against an earthquake. You need to purchase a separate policy for this. As it has mentioned earlier, this insurance provides coverage for the earthquake damages. However, the insurance will not provide coverage for the damages caused by floods and tsunami, even if earthquake has been partially responsible or them. The insurance will provide coverage for any loss due to landslide, shifting of the tectonic plates and mudflow, caused by an earthquake. You have to make this decision on the basis of the locality and value of the property. You will have to estimate the value of the items in the property. Compute the equity in your home. If the construction of the property is not good, then it is likely to be greatly damaged to by an earthquake. You should purchase earthquake policy in such a situation. The insurance company will inspect the property for which you are taking the earthquake insurance. They may check the foundation of the property. They will also inspect the technique used to create cabinet on the walls. The insurer will also scrutinize the straps used to bind various equipments on the walls. 3. The construction of the building is made in brick. 2. Wooden frame structure of the building. You can save as much as $1000 on the premiums. Earthquake insurance comes with deductibles. This implies that you'll have to pay a certain amount for repairing the damages before the insurer provides compensation. The deductible on quake insurance typically ranges between 2% to 20% of the restoration of the building. For instance, if the value of the property is $200,000, then you need to pay $4000 for a 2% deductible. Similarly, you'll have to pay $40000 for a 20% deductible. The insurer will charge low premium rate on the earthquake insurance if you opt for higher deductible. So if you live in an earthquake prone area, then it is better to go for higher deductibles. The insurers temporarily stop selling the earthquake insurance policies after a recent quake. They may not sell any policy till the aftershocks stops. They may agree to resume selling policies after the possibility of further aftershocks declines. Finally, apart from the structural damage, an earthquake can ruin the items in the house. This can be pretty costly. So, you should check each and every cabinet of the building after an earthquake. Find out whether or not the contents of the cabinet are fine. Glance through the walls for any visible crack. Check the electrical lines once. Get professional help if required.